The musical, “Hello, Dolly” has been around since 1964 when the late, great Carol Channing first introduced us to the loveable marriage broker, Dolly Levy. Fifty four years later, Dolly is back on the Broadway stage where she was recently brought to life by Tony award winning songstress, Bette Midler and later replaced with a much acclaimed Bernadette Peters in the title role. Truth be told, it was with a tiny bit of trepidation that I went to see this national tour. Like so many people, I was familiar with the classic title song, but not really having loved the movie with Barbara Stresand, I didn’t quite know what to expect from a show that some might consider an old theatrical chestnut. I’m here to say that all my fears were totally unfounded. 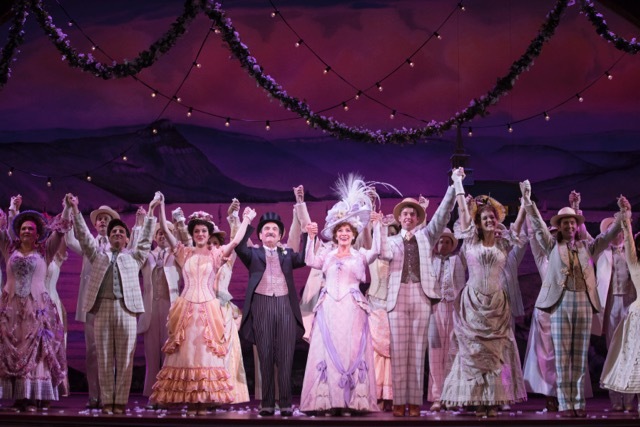 “Hello, Dolly” is a charming, feel good musical romp with an air of innocence that washes over you like a warm summer breeze. 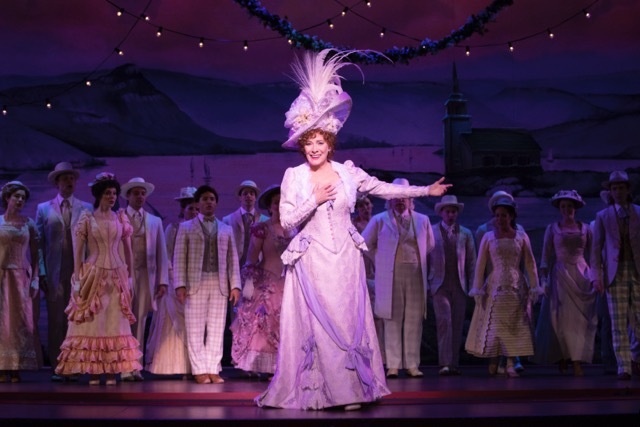 Broadway veteran, Betty Buckley is irresistable in the title role. She delivers a kind, matronly Dolly, a woman that might remind you of a favorite aunt. With impressive vocal and dance skills, Miss Buckley also brings humor and emotion to the role. Her performance certainly touched the opening night audience at the Pantages and had them on their feet more than once during the two hour and twenty minute show. “Hello, Dolly” tells the story of a marriage broker, Dolly Gallagher Levi, who is on the hunt to find a match for the cranky Hoboken “half-a-millionaire” Horace Vandergelder. Vandergelder is hoping to pop the question to milliner Irene Molloy (Analisa Leaming) back in New York. Once he leaves, Vandergelder’s slightly dim witted store clerks, Cornelius Hackl (Nic Rouleau) and Barnaby Tucker (Jess LeProtto), also decide to sneak off to Manhattan for a bit of adventure, and hopefully to kiss some girls. As expected, Dolly’s penchant for meddling soon pairs everyone up. They all find love, including Dolly herself with Vandergelder whom she is sure to tame. Lewis J. Stadlen plays the old curmudgeon and Stadlen almost steals the show with his fluid, vaudvillian delivery and imressive comedic timing. He and Buckley are a fine pair indeed. 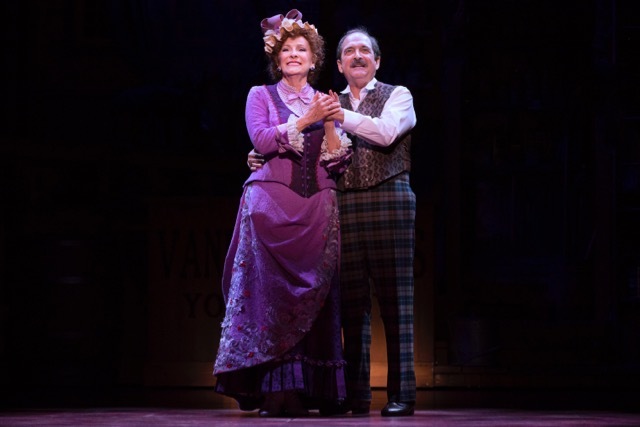 With a book by Michael Stewart, (based on the Thornton Wilder play “The Matchmaker”) and music and lyrics by Jerry Herman, “Hello, Dolly” is joy to behold. Director, Jerry Zaks and choreographer Warren Carlyle have rounded up a rock solid cast that moves like a well oiled machine. Charming cornball humor and impressive production numbers such as “Put On Your Sunday Clothes” and “Before The Parade Passes By” hustle the show toward the moment we were all waiting for. To hear that iconic song. When it finally came and Dolly sashayed down the staircase of the Harmonia Gardens with the cast crooning, “Hello, Dolly, most of the audience could not wipe the smiles off their faces. It was theater magic. There’s no arguing, fellas. She’s back and looking swell. If you love Broadway musicals, this Dolly should not be missed.